This property is on the market for the first time in 30 years. In addition to the main four-bedroom house, it also features a two-bedroom guest house. As both houses are older properties, built in 1979 and 1982 respectively, they are more spacious than most homes built later. The entire land area is 10,078sqft. Helping to emphasise a sense of spaciousness in the principal reception room of the main house are double-height ceilings and floor-to-ceiling windows that bring in light and connect the room with the bay outside. A smaller galleried reception space upstairs overlooks the main reception room. Some of the other rooms, including the bedrooms, have floor-to-ceiling glazing. Wow factor: In work-hard-play-hard Hong Kong, this home offers its occupants an opportunity to get away from it all. Overlooking Clearwater Bay and with its own garden and infinity pool, the house provides a relaxing environment in a rustic setting on the headland. Occupants can watch the sun go down from the terrace while enjoying late afternoon tea or early evening cocktails. This five-bedroom townhouse is in a community of 15 houses built in 1976. In addition to a living room and dining room, there is a garage, helper’s room and utility room. Its two outdoor spaces include a 226sqft garden and 336sqft terrace, while the home’s saleable area is 1,716sqft. he home’s interior designers have used transparent plastic chairs, a glass table and mirrored wall panels to make the dining room feel larger and lighter. Throughout the house, they’ve used oranges and yellows for some furnishings, wallpaper and mirror tints to make it feel homely. Wow factor: Aside from the kitchen and bathrooms, wooden floors are laid throughout, adding warmth to the atmosphere. Large windows and an abundance of light fittings ensure the property can be filled with light, both day and night. Designed to symbolise how its future occupants have reached the pinnacle of success, this brand new triplex penthouse comes complete with a resort-style rooftop pool, huge harbour and city views, and reception spaces of epic scale and grandeur. 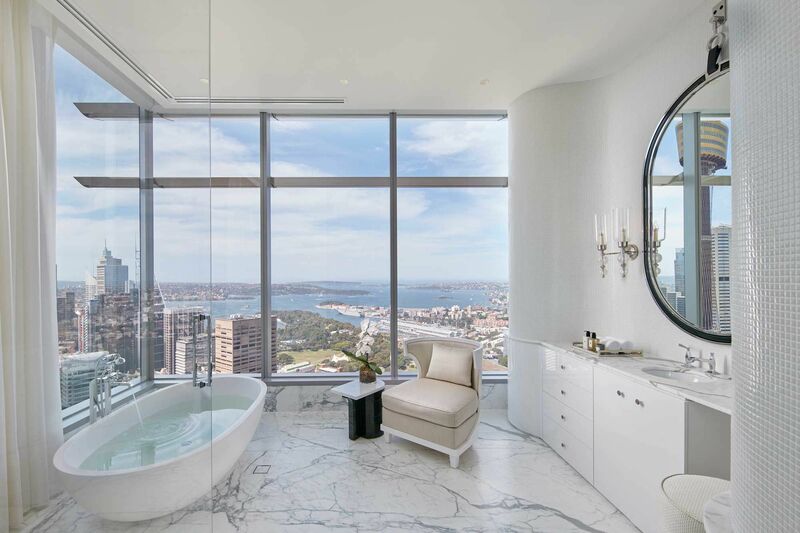 Named the world’s finest residence at the International Design & Architecture Awards 2017, this trophy home is more than 25,800sqft and has four bedrooms, each with its own marble bathroom from which bathers can lie back and enjoy unobstructed views across the city through floor-to-ceiling windows. Secure garaging, 24-hour security and a private lift that opens onto the penthouse’s champagne bar also feature. The expansive study is large enough to resemble a club room. Wow factor: This “sky mansion” occupying the crown of a bank building was originally planned to accommodate corporate entertaining facilities for the bank downstairs, so its interior architecture does not follow conventional form. Instead there are expansive double-height reception areas with soaring walls of glass angling in overhead, and curvaceous interior walls and galleries shaped by guitar-makers, because these forms required their skill to realise. The 200 privately commissioned furnishings make its rooms homely. Previously the home of renowned French architect Jean Walter, the home features three reception rooms that can be opened up to form one large space and which all lead to the garden, making it ideal for summer soirées. In addition to a master bedroom with dressing room and bathroom, another bedroom, study, hammam, 10-metre-long swimming pool, gym and double lock-up garage, there is an adjoining 430sqft flat for staff. Air conditioning and home automation facilities have been installed to match the contemporary interiors. The skylight above the middle reception room, white-painted walls and ceilings, and floor-to-ceiling French doors and windows help to make the interiors feel larger and brighter. Its 4,305sqft of formal gardens are equally stylish, with terraced areas, lawns and sculptures. Wow factor: The 16th arrondissement, where many of the French capital’s museums and galleries can be found, is the most prestigious district in Paris. The area of Le Muette, which is near the centre of the district, is popular with families and business executives. A five-bedroom penthouse spread over two floors, this property forms part of a redevelopment of a striking art deco corner building originally built as a piano showroom. The duplex penthouse forms the pinnacle of the Grade II-listed building’s refurbishment into four apartments by developer Fenton Whelan. The top floor of the penthouse is given over to reception rooms, where occupants and guests can enjoy the six-storey building’s best views of London. The lower floor accommodates the master bedroom, which has its own bathroom and dressing room, and four more bedrooms with en-suite marble bathrooms. In addition to the penthouse, the sale price includes a two-bedroom staff flat in the same building. Wow factor: Fabulous for entertaining. The upper floor has a variety of spaces that combine to make this home a great place for holding parties, not least a wrap-around terrace with views over Mayfair and the City of London. The principle reception space is an L-shaped drawing room with dining area and an additional terrace. A hanging bronze-glass fireplace divides the drawing room’s dining and less formal seating areas. And, for extra glamour, there’s a separate onyx cocktail room. Located on Santa Monica’s Gold Coast, each room in this five-bedroom beachfront home is orientated towards the sea, so occupants can enjoy expansive views of the ocean. This is especially so from the master bedroom, which has 3.6-metre-high glazed walls and looks over Santa Monica Bay and the mountains behind. Designed by Molori, this contemporary home has a combined living and dining room with Italian stone floors and a built-in aquarium, and a sculptural staircase leading to the first floor, which has a variety of other reception spaces, including a study/library that leads to a west-facing terrace. On the third floor, the master bedroom has two bathrooms and a host of extras that make it almost a home within a home. Wow factor: In addition to the nine-metre swimming pool, there’s a private beach area with outdoor dining, barbeque and tanning areas. The beach also has a transparent cabana that can be adapted from bedroom to cinema room. From both the beach and the swimming pool, residents can watch and hear the ocean and enjoy glorious Californian sunsets. Indoors, there’s a home cinema, family room with bar and a chef’s kitchen.